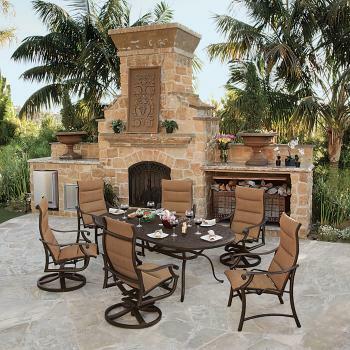 We carry over 4,000 square feet of quality patio furniture on display year round. 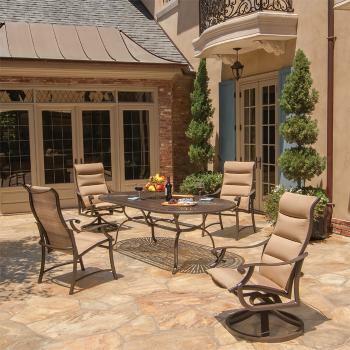 We offer many different styles of outdoor patio furniture and can do frame finishes as well as hundreds of Sunbrella outdoor fabrics to enhance your outdoor living area. 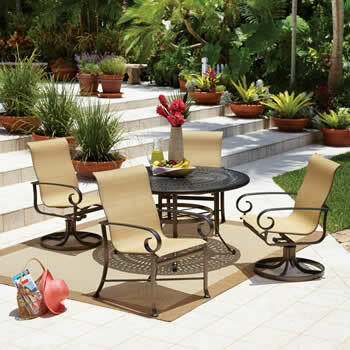 Heavy Duty Cast aluminum furniture will never rust and will last you a lifetime. 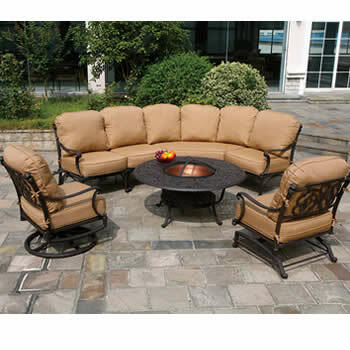 Can be used as outdoor furniture in the elements or under a covered porch or patio. 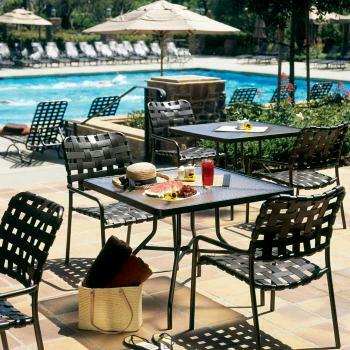 This style furniture is great to use around pools. The aluminum frames never rust and the sling chairs dry fast and hold up to the kids jumping in and out of the pool. Aluminum frames never rust and we carry virgin vinyl straps that won’t sag over time. 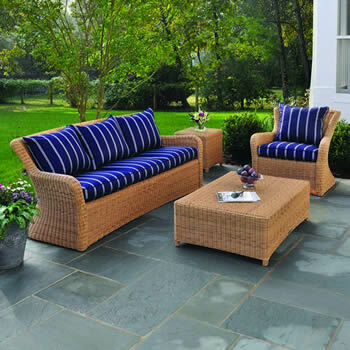 Great for pools and any outdoor furnishing setting where you don’t need cushions. 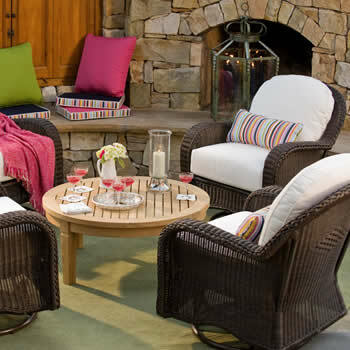 Classic all weather year round furniture styles that can be used with or without cushions. Goes well with our traditional wrought iron fencing, matching wrought iron pool & patio railings and coordinating outdoor wrought iron light fixtures. We offer many different varieties of Vinyl Wicker wrap around aluminum frames that are built to last. They look great and can be used with our stylish and affordable selection of weatherproof cushions for covered areas such as an outdoor room. 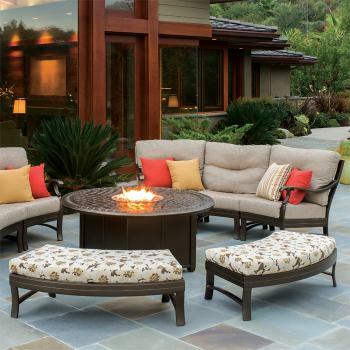 These groups are so comfortable you could put them in your living room. 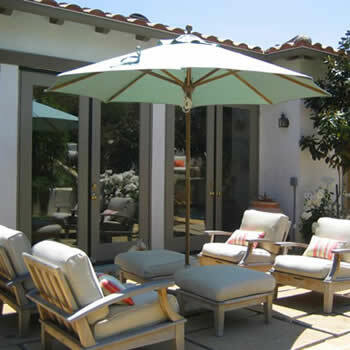 Best as covered porch seating but, with our Sunbrella sun resistant & weather resistant fabrics, our deck lounges, outdoor seating and patio tables can be used outside. 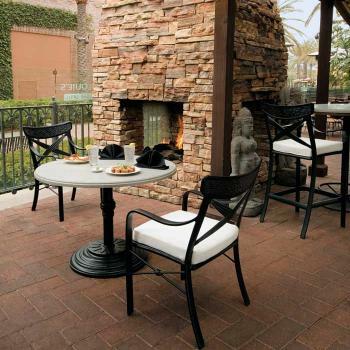 We offer beautiful styles in outdoor dining tables and exterior chairs and can custom order different sizes to fit your outdoor dining needs. Teak is a dense oily wood used on ships. This is the best wood for outdoor furniture.